In his report on the World Humanitarian Summit “One Humanity: Shared Responsibility”, the former UN Secretary-General proposed an Agenda for Humanity that would help to meet people’s immediate humanitarian needs - while at the same time reducing risk and vulnerability. This “new way of working”, adopted by eight UN humanitarian and development entities, aspires to work towards collective outcomes across the humanitarian and development community. Wherever possible, those efforts should reinforce and strengthen the capacities that already exist at national and local levels, whilst ultimately working towards the achievement of the Sustainable Development Goals. 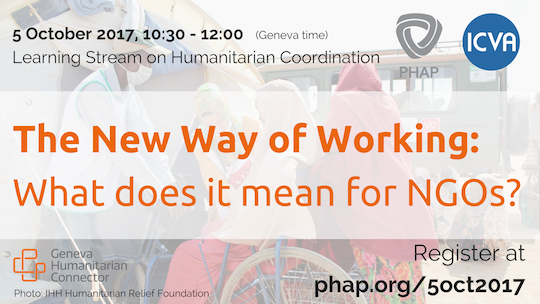 Join us on 5 October for the fifth online session of PHAP’s and ICVA’s learning stream on humanitarian coordination, which will focus on the New Way of Working, unpacking overall goals, what changes are needed across the sector, how these changes impact NGOs, and how can NGOs influence this process. To see when the live session will take place in your time zone, click here.